I spend a great deal of time in my car. It’s my office. When there is no one I’d rather have lunch with other than myself, it’s my favorite lunch spot. It’s the place where I get informed about the world and politics and the place where I memorize and study my Bible (via my tape or CD player). I’ve spent hours studying Korean in my car. It’s one of my favorite reading spots and the place where I listen to Christian music. I prepared for praise and worship and for The Special Gathering Choir in my car, rehearsing the music for endless hours. It is often my prayer closet where I speak loud and long to the Lord. As you can tell, I spend at least three to four hours in my car almost every day. Because The Special Gathering which is a ministry within the mentally challenged community is scattered up and down the East Coast of Florida, those of us who minister within this small sphere spend more time than we like to admit in our cars. However, we’ve become pretty creative in our time management. In the mornings and late in the afternoons, I listen to National Public Radio for several hours. In between, I listen to talk radio. I feel this keeps my political equilibrium pretty much balanced. I now have a car with a CD player. Therefore, I’m listening to my Bible. I’m also finding that memorizing has come easier over the years and I’m having great fun memorizing parts of the Bible that for years I thought I couldn’t digest. Most of my life, I’ve wanted to learn another language. My daughter-in-love is Korean. So speaking Korean seemed a natural step for me. When I had only a tape player in my car, I found the repetitive playing of the tapes that I needed ruined them. Therefore all my Korean tapes were soon destroyed. Now, I’m excited to get some Korean CD’s that will hone my listening and speaking abilities. When I discovered Lemony Snickett via my six-year old granddaughter, the two of us enjoyed the perils of the children in their fictional adventure. It was a wonderful together time though we were separated by more than a thousand miles. Deuteronomy 6 explains that we are teach our children and talk about the ways of the Lord when we are sitting at home, “when we walk along the road, when we lie down and when we get up.” The great commission, I’m told, could better be translated, “As yougo into all the world…” This gives me great comfort as I travel from Melbourne to Merritt Island to Vero to Fort Pierce. With that in mind, as I journey from Indian Harbour Beach to Cocoa or Daytona or DeLand, I work at creative ideas for making my trip more productive. Of course, I’m not alone. There are millions of people who are busily moving from job site to job site each working day. Keeping aware of the traffic and keeping close contact with the Lord is a balancing act. Beside smearing ketchup and mayonnaise all over your best trousers, what are some of the creative and productive things you do in your travels? Christians and Jews have always been known as people of the book. But most of the members of Special Gathering, a ministry within the mentally challenged community, do not read. 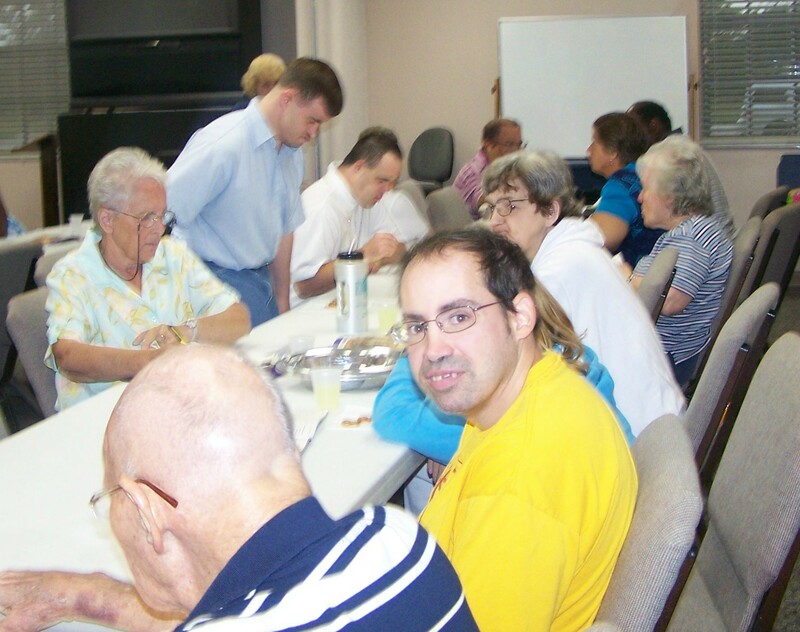 The Melbourne and Vero Special Gatherings have about 100 people who are developmentally delayed who attend each week. We do classic ministry, evangelism and discipleship. Because of their inability to read, I have a difficult time selecting different people each week to read the Scripture text. The early Catholic church faced the same problem in the early centuries. Most of the people they evangelized were not able to read. In fact, it is the Christians who have been the largest proponent to education over the generations. It is considered essential to the Christian faith to understand the scriptures. Growing in grace is deep wrapped in becoming a part of the Word of God. However, the developmental disabilities of our members make this difficult. There are things which can be done, however. My father was a brilliant man with an 8th grade education who taught himself to read, only after he became a devoted Christian. He wanted to be able to read the Bible. He used tape recordings of the Bible to help him. He would read along with the Bible tapes. He not only became knowledgeable about the Bible but a great reader. In the same way, we encourage our members to purchase Bible CD’s and listen to them. The Dollar Stores have Bible CD’s for $1. For Christmas this year, we gave all our members a Bible CD. We encourage our members to get additional CD’s and listen to them. The whole Bible on CD’s can often be purchased for a nominal price. I have begun to incorporate one Bible verse each quarter as our Call to Worship. In this way, they are exposed to an essential Bible verse 9 times a year. One of our Bible teachers in Daytona took well over a year to teach his lower functioning members one Bible verse. “I will pray morning, noon and night.” What a great verse to learn. At first, I thought he was really wasting their time until the verse began to penetrate my spirit. I came to love hearing his recitation of that verse. Often, it comes back into my mind, reminding me of the importance of prayer and reminding me to pray. What are some of the methods that you have used to teach your members the Bible? Do you teach Bible verses or the principles of the scriptures? Which do you think is more beneficial?